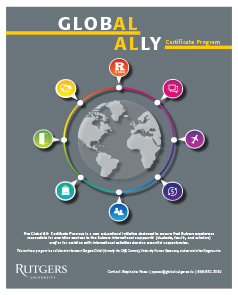 The Global Ally Certificate Program is an educational training program open to all full time Rutgers faculty and staff. This free, non-credit program is a collaboration between Rutgers Global, University Human Resources, and several other units. Presented by subject matter experts, the program is designed to share best practices and resources to ensure that employees responsible for providing services to the international community or assisting with international activities develop essential competencies. All courses in the program are three to four hours long. Faculty and staff who wish to earn a Global Ally Certificate must complete all four foundation courses and two elective courses. To register, visit the UHR course registration system and search for program code "RGA000." You must take all four foundation courses and two elective courses to earn the certificate; see below for links to register for individual courses. April 18, 2019 | 9:00 a.m.–12:00 p.m. This course will provide an overview of international activities at Rutgers, including the work of Rutgers Global and its various units. Participants will gain an understanding of Rutgers as a global university, why that is a good and necessary goal and aspiration, what internationalization requires of all of us as staff and faculty, and the resources available to all towards Rutgers’ overall internationalization. December 5, 2018 | 9:00 a.m.–12:00 p.m.
Our campuses are very diverse, and it is essential for staff and faculty to be culturally aware so that they are able to better serve the various constituents of the Rutgers community. This course will encourage participants to expand their conceptualization of culture and their understanding of communication. Activities are designed for participants to learn strategies to improve their cross-cultural communication skills and apply those skills to their everyday work. Rutgers students, faculty, and staff travel internationally to study, conduct research, and engage with global partners. This course will introduce participants to the federal, state, and university travel policies and cover a range of topics including travel registration, risk management, and financial guidelines. Both travelers and those who organize international travel would benefit from understanding how to manage international travel effectively. December 14, 2018 | 9:00 a.m.–12:00 p.m.
From paying foreign nationals to making international wire transfers, this course will help participants understand the complicated nature of processing international financial transactions. This course will review university policies and offer tips on using Cornerstone. Even non-business specialists will benefit from understanding processes in order to manage expectations for research grants and other international activities. April 10, 2019 | 9:00 a.m.–12:00 p.m. This course will provide information and guidance for administrators and academic advisors working with international students. Topics discussed will include an introduction to the services provided by Rutgers Global, immigration/visa regulations as they affect students’ academic progress and employment eligibility, and a review of the forms and documents required by international students to maintain their status. October 25, 2018 | 3:00–4:30 p.m.
Rutgers faculty and staff play a critical role in encouraging more students to consider studying abroad. In an effort to expand our reach and to increase the number of students that pursue learning opportunities abroad, this course will help Rutgers faculty and staff gain a better understanding of the study abroad process and the role they can play in encouraging their students to take advantage of this life-changing opportunity. March 27, 2019 | 9:00 a.m.–12:00 p.m. This course will review procedures and tools to assist faculty and staff to prepare for and host non-traditional international students and scholars (individuals who come to Rutgers on visas other than J-1 student visas and J-1 scholar visas). Topics discussed will include the proper methods for hosting Fulbrighters, sponsored students, student interns, other short-term international visitors, and international delegations.